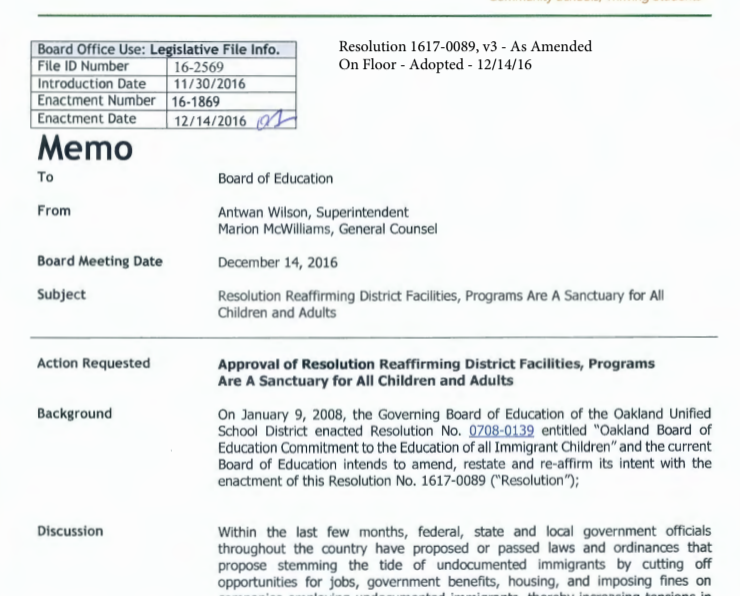 Oakland is a Sanctuary City and OUSD is a Sanctuary District. We do not ask for or require proof of legal immigration status upon enrollment, nor is any such information gathered by a school. Hundreds of undocumented, newcomer and refugee students are thriving in our schools with help of the Office of English Language Learners and Multilingual Achievement (ELLMA) and we want to keep it that way. Understand the plans in place at OUSD schools in the case of ICE activity as well as how families can make a plan if they need to. Available in Spanish, Chinese and Khmer. Gov. Jerry Brown signed landmark “sanctuary state” legislation on October 5, 2017, vastly limiting who state and local law enforcement agencies can hold, question and transfer at the request of federal immigration authorities. The OUSD Sanctuary Resolution, adopted in December 2016 affirms that we will do everything possible to ensure students and families are safe at school regardless of immigration status. Click on the image below to read the resolution!